I would like to introduce a high probability trade setup for intraday trading, which is divergence in 5 min intraday charts. (Other time frames may also be used, but I am comfortable with this time interval). A bearish divergence occurs when price makes a higher high, but indicators does not move up accordingly. A bullish divergence occurs when price makes a lower low, but indicators does not. For intraday trades, divergences if any will be seen during the second half of the day. There are some additional conditions and confirmations required. 1. Volume on the second high or low should be lesser. 2. The trade setup should be confirmed by another bullish or bearish sign. This could be an MA crossover or stochastics buy/sell which follows the divergence. 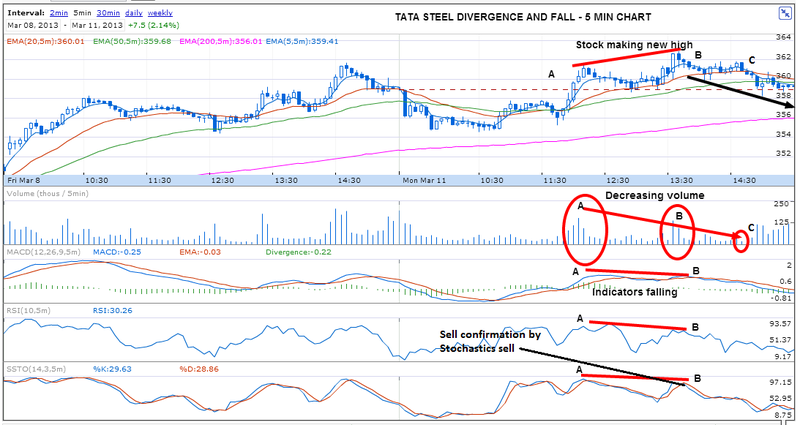 The Tata Steel intraday chart of 11 March is a good example of divergence setup. The stock made two highs A and B. B was above A and also above previous day's high. However , the top B was made with a lower volume. Another attempt was made at C this time again with a lower volume. Corresponding to A-B price movement, Indicators were either flat or pointing down. 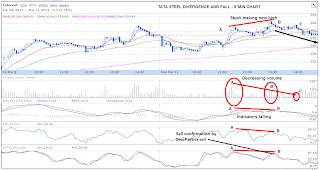 A stochastics sell hook just after point B gave a confirmation for sell. Please click on the chart and read for more information.